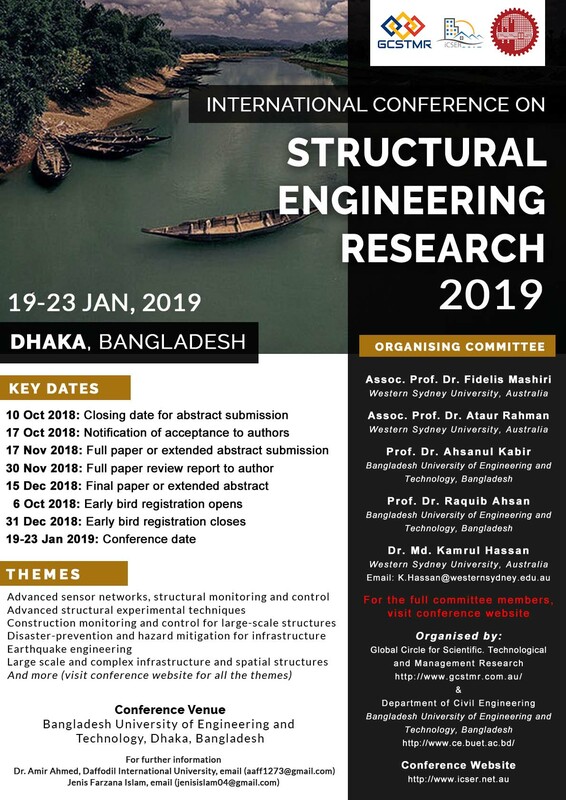 The International Conference on Structural Engineering and Research (iCSER-2019, Dhaka) will bring international and national experts in Structural Engineering to Dhaka (the capital city of Bangladesh) to present and share their latest research and practice. Infrastructure is a key aspect of modern civilisation. Structural engineers plan, design and construct numerous structures such as buildings, roads, tunnels and bridges among other infrastructure. The recent research, practice and advancements in Structural Engineering will be discussed by many international leading experts and professionals who will gather at iCSER-2019, Dhaka, Bangladesh. The main objectives of this conference are to provide an opportunity for professional interaction amongst the researchers, engineers, academics and students, and to showcase the latest developments and future trends in their fields. The iCSER-2019 is supported by the Global Circle for Scientific, Technological and Management Research (GCSTMR) as its 4th World Congress. GCSTMR endeavours to create a platform for young researchers to exchange ideas and share information with experts in their respective fields. GCSTMR encourages and facilitates trans-national collaborations among its members and associates in research, training and professional activities. Multidisciplinary international conference series run by GCSTMR could open vast opportunities for researchers enabling them to interact on the global platform, as well as to seize the advantage of knowledge sharing in the digital arena. iCSER2019 is proudly organized by Global Circle for Scientific, Technological and Management Research (GCSTMR).and Bangladesh University of Engineering and Technology (BUET).